This is my first "green colour" lenses & I chose this colour coz Im a little bored with grey, blue, n purple colours. Lol. When I received these lenses, they really do amaze me coz the design is really beautiful & remind me of flower pattern. The color looks more vibrant than its advertise picture & really standout without using flash. The green color makes me feel like born-to-be fairy and not like an alien. 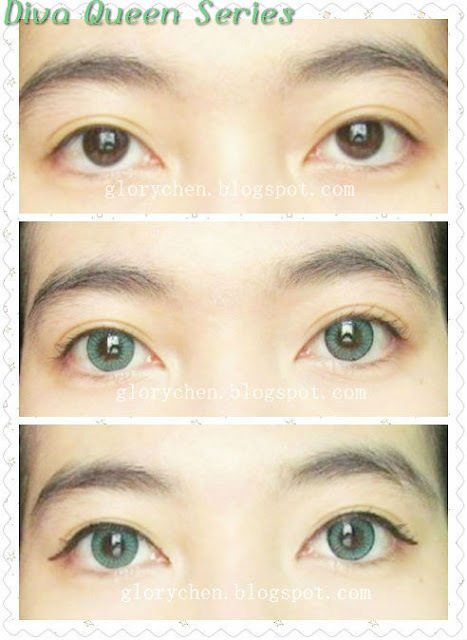 :) MyGeoLens's owner said these lenses are categorized as their best-seller lens product. The black outer ring makes the enlarging effect is quite big and gives my eyes dolly-effect look. These lenses actually are quite comfortable in my eyes, but it's only lasting around 2-3 hours. Then, my eyes began to feel inconvenience, and it makes my eyes get sore. While wearing the lenses, I need to use eye drops to make the comfort last longer. The color & design are far away from natural look but I love how they blend nicely into my dark brown-color eye, and at the same time the enlargement provides a dolly-fairy effect. The color looks brighter in the real-life and I can't stop staring at my eyes coz they really look beautiful like dolly-fairy eyes. LOLOL. Lenses can be purchased here. So yeah I'm really happy with these lenses coz the design & color are really outstanding but it's also less comfortable, so maybe sometimes I'll be wearing them like when Im going to party or hangout that usually only takes 2-3 hours long. Thank you for reading my blog & see you soon! There are retailers that sold colored contacts by pair to set of six. Sad to say but there are still quite a few individuals who don’t know how to purchase these things online.